One of the biggest threats to your life in a high-rise apartment can be a fire. After all, high-rise fires have been the result of many catastrophes in American history; claiming chunks of lives in one foul swoop. The smallest spark can have a life of its own, quickly growing into a blaze that’s engulfing the building. The scent of smoke and the roar of the flames rushing through the halls of the building will send high-rise dwellers into panic mode. If you live in a high-rise apartment building, don’t take fire safety lightly. Even if you are a cautious person, another person living in the same building may be careless. In the event of a fire, remember to stay calm and think before you act. We have gone ahead and put together a list of fire safety tips from sources like Insurance Information Institute. While some of these tips are specific to high-rise fires, most of them can be applied across platforms. I know, it seems insane telling someone in the middle of a fire not to panic. Staying calm will help you think straight and remember the tips to come. Even if the smoke is light in the apartment, don’t stand up. While the smoke may not seem thick, inhaling it can be detrimental to your chances of survival. Cover your mouth and stay low. Personal belongings aren’t worth it. Don’t bother gathering all of your personal belongings. The only thing you should make sure to grab is your keys because you may need to turn back if the fire is blocking the stairwell. Feel the door before opening it. Use the back of your hand to feel if the door is hot. If the door is hot, do not open the door, the fire is right outside. If the door is not hot, use the door to exit your apartment. Then find the nearest staircase and exit the building. If you’re unable to leave your apartment, wait for help. If the fire is right outside your door, do your best to cover and vents or crevices that the smoke can seep through. The fire department even suggests putting wet towels or sheets at the base of your doors. I repeat, DON’T JUMP. This is an important one. When you jump out of the window, not only will you supply the fire with more oxygen, but you might not survive the fall. We hope that you will remember some of these tips if you’re ever involved in a high-rise fire. Always remember to practice fire safety. While another person may not, you can sleep easy knowing that you are doing your part to keep the building safe. If you’ve ever said to yourself “it’ll never happen to me” about anything, then watch out. Life has a way of surprising us, and no one’s invincible. Sometimes fires can spread because of nature, sometimes because of careless personal accidents or sometimes because of the negligence of our next door neighbors. It’s important to be prepared, and fire is like everything else: sometimes knowledge is power. These are some of the common causes of house fires, so read on to see if you’re making any mistakes that could leave you homeless. Distraction is the number one cause of house fires. This can remain true in several situations. If you’re a lover of candles, you need to remain absolutely vigilant. If candles are left near flammable materials, a fire may result. However, sometimes store-bought candles come in glass containers. These can crack or break, spilling wax and flame all over the place. Make it a routine to keep candles burning for only so long, then extinguish them. You’re giving your body a break, too: left burning for hours on end, candles can be carcinogenic. People are also prone to distraction while they cook. We live in an era of kitchen TVs and smartphones that force our attention away from the task at hand. Cooking fires can be even more dangerous because people don’t know how to properly extinguish them. First, extinguish the source of the flame. If you’re cooking with oil or grease, do not use water to put out the flame! Cover the fire with another pot or pan, or, alternatively, dump baking soda on it. For larger fires, use salt! These two causes of house fires can also result in a pretty terrible burn injury. If you get hurt while trying to put out a fire, seek medical attention right away. Smoking is also a great way to distract yourself. Many smokers don’t pay attention to where the cigarette lands after they flick it away, and this leads to a number of unexpected fires. Try to smoke outside, and be sure to have a dedicated waste receptacle for cigarette butts. It’s important to do routine spot checks of any electrical device you own. Make sure the wiring isn’t frayed or defective. All it takes is a single spark to burn your house down, and you’d be surprised how common those sparks can be–especially if you own pets that like to chew on things when you’re not looking. Avoid using water on electrical fires. These are best extinguished by removing the oxygen, but remember to pull the plug first. If you have kids, teach them about fire safety as early as possible. Inquiring minds want to know, and even as adults–fire can be awesome. For kids, the urge is even worse. How does this burn? How does that burn? Teach them how to get out of the house, and try to keep matches or other fire starting devices well out of reach. Like any law currently on the books, the crime of arson might not be as simple as it sounds. This is especially true because the extent of the damage might not be apparent at first glance. There’s a difference between setting fire to a single tree in the middle of the forest versus burning someone’s home down. How the crime of arson is treated also depends on the region where the crime is committed, and other factors that may determine the legal outcome of arson involve degree of severity. Usually, firefighters called to the scene will be able to quickly determine whether or not the fire was accidental or intentional. This is because most arsonists will use an accelerant to help feed the fire. First of all, the crime of arson assumes you deliberately and/or maliciously set a fire with the intention to damage property. This can include privately owned homes, vehicles, or other property, but it can further extend to government parks or forests. If you set fire to a home that has been abandoned, you’ve still committed arson. If the fire you set was accidental, then you may not be charged with arson. In such a case, it’s important you find yourself an experienced lawyer like the ones at Barket Epstein to help you navigate the complicated laws that will help govern your case to conclusion. It’s also worth noting that if arson results in the death of another, the perpetrator will likely be charged with murder. Sometimes peoples think they can circumvent the law by burning their own property in an attempt to collect insurance payouts, but an arson charge still applies. The degree of severity is usually divided into several classes of intent. First-degree arson generally refers to the setting of a fire in an occupied building, whether that building has one or more occupants. This charge is more likely when someone inside a building has been injured or killed as a result of the blaze. Second-degree arson results from the burning of an unoccupied building. If a building has been abandoned or is not in use, then an arsonist will likely be charged in the third degree. There are other degrees depending on where one lives. In addition to the degree of severity, other labels may be used to categorize the crime. Arson may be charged as a misdemeanor, a felony, or prosecuted as criminal mischief. Some areas differentiate between accidental, reckless, and intentional setting of fires. This is why fire safety is so important; if you’re not careful, you may be charged with reckless burning of property because of your negligence. The last half-century has been an incredible time for the medical community, and certainly for those whose lives have been saved by the advances of medicine and surgical offerings. We’ve learned a lot about how certain foreign objects or particles affect our bodies, for better or worse, and we’re learning more everyday. The next decade promises to bring advancements that most of us can’t even imagine. Even with all the changes, smoke inhalation is still extremely dangerous. These are just a few of the ways in which smoke affects your lungs. First, it’s important to know what kind of smoke you’ve inhaled. Smoking is obviously harmful to your overall health, and can shave years off your life. Because of lung-related diseases, cancers, and other related ailments that crop up over time, taking a single breath in your later years can become a grueling challenge. Smoking doesn’t just damage your lungs, though. It affects your brain and heart as well, and negatively impacts your entire body. It has an adverse effect on blood circulation, which leads to a number of cardiovascular conditions. These include heart attack, coronary heart disease, damaged blood vessels, and damaged arteries. This can also cause stroke, which can result in major brain damage and leave you severely disabled for the rest of your life. Smoking can also increase your chances of developing a life-threatening brain aneurysm. When these abnormalities in the brain-based blood vessels pop, many people do not survive. They are extremely dangerous, and the likelihood of occurrence will only go down if you quit smoking for five years. Smoking can reduce your fertility, irritate and age your skin, weaken your bones, cause bad breath, stain your teeth, and increase the chance of stomach or lung cancer. The list is endless, and only you can protect yourself from these side effects. 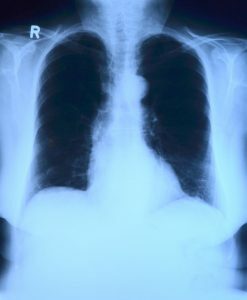 Second-hand smoke can have similar effects. So can simple wood-burning smoke. In fact, studies have shown that wood-burning stoves can adversely impact your health as well. The normal signs of poor health from other kinds of smoke include lesser symptoms like coughing, wheezing, and asthma, but also can include more serious conditions like heart attack and lung cancer. Like smoking cigarettes, they reduce the number of years you have left. This is because burning wood or other materials releases the pollution that those materials have stored inside. Burning wood releases dangerous carbon monoxide and other air toxins that can be extremely hazardous to your health. No matter the type of smoke inhaled, you should be aware that you’re increasing your chances of mild short-term health problems and dangerous long-term health conditions. In order to reduce these chances, do not smoke, and avoid casual burning of wood or other materials. You shouldn’t breathe in any smoke inclulding marijuana smoke. You can get pulled over for a Drug DUI. That can be bad for you and your family. One of the most terrifying events imaginable is the destruction of property–or even life–in a fire. Even if everyone makes it out okay, you know that many of your cherished memories and probably some valuables are gone forever. There are some things that insurance money simply cannot replace. Even though this possibility is scary, sometimes knowing that it’s happening to people you care about is just as bad. What happens when you look next door and there’s smoke pouring from inside your neighbor’s house? It can be difficult to know what to do during a time of panic, and you’ll want to know how to help the most. First, don’t assume that someone else will call 911. Don’t wait in an effort to find out if it’s already been done, either. Do it yourself, and do it right away. Second, do not put yourself in danger. Legally, it’s best to help from outside. Putting yourself in harm’s way could make the problem even worse. If your neighbors escape through the back door but you go in the front, someone might then come looking for you. Keep in mind that if any help you provide actually results in more damage to the property or even surrounding homes, you might be liable for whatever your neighbor’s insurance does not cover. Even if you’re just trying to help, you have to think about your own wellbeing too. Things can get more complicated the bigger the fire becomes, especially in a densely packed residential area. Sometimes a fire will move from one home to the next, and in this case liability becomes a primary concern for everyone affected. If your own home was damaged because of a fire at a neighbor’s home, then be sure to document the area as best you can, and provide a full report of whatever happened to the authorities. After that, submit a request to your own homeowners insurance. They might cover some of the damages, or they might hassle your neighbor’s insurance company to cover the costs. Either way, it shouldn’t remain your responsibility. The same is true if your neighbor’s negligence caused your own home to catch fire. In the worst case it could turn into a criminal issue, but that’s for the authorities to decide. Do your best to provide a true and unbiased accounting to any questions you might be asked by police or insurance investigators. These questions might be extremely uncomfortable, but they’ll save everyone a lot of trouble down the road. That’s it. There’s not much you can do if your neighbor’s house is on fire. Call the authorities, provide whatever first aid you can a safe distance away from the burning home, and let firefighters do their work. Then again, if your neighbors ask for your garden hose–turn on the water. Here is a video of someone’s neighbor’s house on fire – quite a scary event! In December of 2017, we witnessed mother nature at her worst. A bevy of wildfires popped up throughout the state of California. The fires ranged from north San Francisco to San Diego. The most threatening fires were in northern San Fernando Valley and northern Los Angeles. The largest fires consumed 90,000 acres in just a few days. The incredibly large fires took the state and nation by storm. The Thomas Fire burned through the woodlands to the north of Ventura. The Thomas Fire became a viral video when it burned right up to the edges of the 405 Freeway, where roughly 400,000 cars use for transportation per day, and shut down the northbound lanes. Nearly 200,000 people were forced to evacuate Ventura, Los Angeles, and their surrounding areas. In the Bel-Air area, an additional 700 homes were evacuated due to a 475-acre fire burning on their heels. 2017 began with an unusually high amount of precipitation. The heavy precipitation in the beginning led to massive vegetation growth. In a normal year, the vegetation growth would not be a big deal. Unfortunately, the high precipitation was followed by an extremely dry summer, drying out the vegetation that had just grown. This leaves a bountiful of fuel for the fires to burn. It has been reported that fire season is getting longer every year. The expanding season has been attributed to climate change. California has been developing rapidly. Residential areas are expanding closer to the woodlands, putting homes closer to the danger areas that they have been in the past. One area that was affected by the fires in Santa Rosa. Santa Rosa’s population has increased 13% from 2000-2010. The wildfires of December 2017 destroyed 5% of the homes in this town. The Santa Ana Winds are winds that bring hot, dry air from inland California towards the Pacific Ocean. These winds were consistent during the fires, at some points reaching gusts of 80 mph, carrying the fires over large areas. In 1781 a man who made one of the most accidental discoveries in the history of the world was born. John Walker is the man who invented the match, even though he did not set out to. During the early 1800s John Walker was a scientist working in a lab attempting to create a lighting component. He was mixing the chemicals with a wooden spoon. When he was finished he went to rub the excess chemicals off of the spoon. At this moment, the friction cause a spark and the first match was born. His partner in the laboratory, Samuel Jones, then went on to create the brand “Lucifers.” Lucifers were sold in London and most commonly used to smoke tobacco. 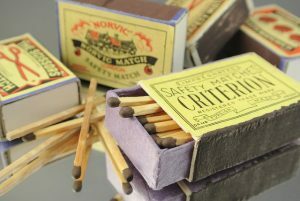 The original match was created out of antimony sulfide, potassium chloride, gum, and starch. John Walker was not able to make a large sum of money off of his invention. The independently wealthy scientist refused to patent what he had created. Without a patent, any individual was left free to recreate Walker’s invention, creating a wealth of competition. Isaac Holden tried to take credit for Walker’s invention. Holden made his idea public in October 1829, about two and a half years Walker took his invention public. Throughout the years, matches have changed quite a bit. The original chemical components were antimony sulfide, potassium chloride, gum, and starch. Since then, Isaac Holden’s version were sulphur based, Charles Sauria’s version of matches were white phosphorous-based. Sauria’s version came to an end when white phosphorus was banned for toxicity. Today’s current matches are composed of phosphorous and with potassium chlorate. The reaction occurs when the match is struck against a rough surface in order to generate friction. Today, there are also “strike-anywhere matches”. Strike-anywhere matches have an added amount of powdered glass which cause friction against multiple surfaces. Fire is not something you want to play with. Matches, if left unattended or treated with careless behavior, can turn a small fire on a wood stick into a massive blazing fire that puts people’s lives in danger. When you are dealing with fire, it is important to follow standard safety procedures and make sure the flame is completely out if the fire is left unattended. When speaking of famous fires, there are always a few that quickly come to mind, for example, the Great Chicago Fire, The Great Fire of London and the San Francisco Earthquake Fire. In reality, most of the major cities of the world have been burnt to the ground, at least once. In some cases, these great fires have been caused by war, like when Sherman burned the city of Atlanta, destroying some 3,000 businesses, hospitals, homes and schools. More often, they have been the result of natural disasters, like earthquakes, and poor methods of construction, made worse by the difficulty of fighting fires that reach a certain size or cover multiple locations. The Great Chicago Fire started in the evening of October 8, 1871. While records show that it did likely start in a barn owned by Patrick O’Leary and his wife Catherine, there is absolutely no evidence that it was the fault of the family cow kicking over a lantern. Propelled by Chicago’s never-ending wind, the fire spread over 2,000 acres, right through the heart of the city, in a little over 24 hours. The death toll was under 300 people, but more than 90,000 were left homeless at the start of the frigid Midwestern winter. The massive destruction resulted in Chicago rebuilding based on what was learned from the fire and Chicago’s fire department became a model for other large cities. National Fire Prevention Week was created to commemorate the Great Chicago Fire and has been instrumental in increasing awareness and promoting prevention in an effort to keep tragedies like this from happening again. The Great Fire of London began on September 2, 1666, in a baker’s shop, and lasted for several days. We think of London as being this wonderful European city built of stone and brick. Not so in 1,666. In those days, there were closely packed houses constructed mainly of very dry and brittle wood. The fire burned for four days, destroying more than 13,000 homes, churches, including St. Paul’s Cathedral, and other buildings. Fortunately, and quite amazingly, very few lives were lost. In addition, there was actually a benefit that came out of this catastrophic event. The area of the city in which the Great Plague had settled the year before was entirely destroyed by the fire, in effect, sterilizing and making it inhabitable again. London, like Chicago, learned the lessons of this monstrous fire and rebuilt using brick and stone. It’s not as easy as being able to click here to stop a fire, but the building codes are much more progressive. The San Francisco Earthquake Fire was started by the rupturing of the San Andreas fault on Wednesday, April 18, 1906, but the scale of the fire was more because of broken and leaky gas lines and firefighting errors. San Francisco’s Fire Chief, Dennis T. Sullivan, died in the initial earthquake, leaving a lack of leadership that led to disastrous decisions, such as using dynamite to create a firebreak. This only resulted in more fires, covering 490 city blocks. Nearly 25,000 city buildings and homes were destroyed, and the death toll was believed to be 3000, most due to the fires. San Francisco’s building codes are now among the most progressive in the world. 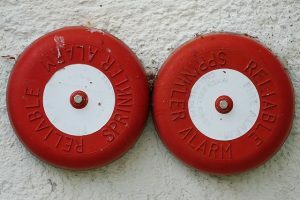 Do Fire Alarms and Smoke Detectors Keep Families Safe? Fires in the home start for a variety of reasons. Cooking fires are high on the list, but so are things like candles left burning, smoking, electrical issues from faulty wiring and appliances and a range of other factors that are likely to occur at night, while everyone is asleep. In fact, half of all deaths from home fires happen between 11:00 p.m. and 7:00 a.m. Fire alarms and smoke detectors cannot prevent these fires but they can keep families safe from injury and death, as well as reduce overall property damage. The one major roadblock in their effectiveness is the human factor: fire alarms and smoke detectors must first be installed and then maintained. The vast majority of homes in the U.S. have at least a one smoke alarm, which is a very good thing. Less good, however, is that three out of every five deaths related to fire in the home, was the result of no alarms present or none that were working. This strongly implies that many, if not most, of those deaths might have been prevented with a $49 smoke detector or a new package of batteries. Smoke detectors that are hardwired into the structure’s electrical system are more effective than those that operate solely on batteries. This takes the need for the batteries to be checked and replaced on a regular basis out of the equation. There is also the ability of hardwired detectors to be interconnected throughout the house, which increases warning time for those farther away from the point of origin of the fire. NFPA reports that the death rate is 2.5 times as high in fires where there are battery-powered alarms instead of those that are hardwired. Fire alarms and smoke detectors can play a very large role in keeping people safe in the event of a fire, but only if they are used properly. Units installed in more locations or increased alarm volume may be required if the occupants have disabilities, take medications that cause them to sleep especially soundly, overuse alcohol or drugs or when there are other mitigating factors. Not only do batteries need to be tested and replaced but nuisance alarms must be taken care of in a responsible manner: ripping the unit off the wall because it goes off at the wrong time is, obviously, not responsible. When a smoke detector isn’t functioning properly it must be repaired or replaced immediately. Not doing so puts family members at significant risk. In 2015, there were more than 1.3 million fires in the U.S., resulting in the deaths of 3,280 private citizens. More than 68 thousand firefighters were injured, 68 of them fatally. Many of these fires could have easily been avoided with simple precautions and foresight. Cooking – according to the NFPA, “cooking is the leading cause of home fires and home fire injuries and is tied for the second leading cause of home fire deaths.” These fires tend to happen while frying or when cooking is left unattended. Keep paper towels, pot holders, cookbooks and other combustible materials away from burners and never leave to check your favorite website while something is cooking on the stove or in the oven. Candles – everyone loves the glow of candlelight, but candles are a major cause of home fires. They often start due to being left too close to flammable items, left unattended or accidently knocked over or being brushed against by a dog or cat. When you leave the room, blow out the candles. Smoking – smoking was the leading cause of home fire deaths for decades, but the number has been coming down, mainly due to less people smoking. For those who do continue to smoke, never do so in bed, when overly tired or anywhere in the vicinity of medical equipment or oxygen. Clothes dryers – dryers contain a heating element, and it should not come as such a surprise that they carry a significant potential for starting fires. It is important to consistently clean the lint trap, as well as the vent pipe and area where the screen is housed. Always keep combustible materials away from the dryer. Children playing with fire – children start more than 7,000 home fires a year, per the NFPA. They should not have access to matches, lighters and other ignition sources and should be taught fire safety as early as possible. Electrical – electrical fires can be due to a variety of reasons, such as equipment malfunction, overloaded circuits, damaged cords, overheated light bulbs, space heaters and other appliances and causes. Make sure to replace frayed cords and damaged plugs. Never run wires under rugs or furniture, and think twice about do-it-yourself electrical projects. 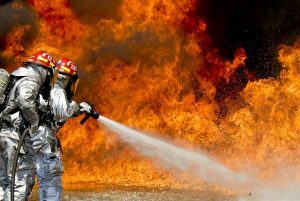 Flammable liquids – fuels, cleaning supplies, solvents, paint and dozens of other liquids stored under kitchen and bathroom sinks, as well as stacked and stored in closets and garages, can ignite from a simple spark or even excessive heat. Store outside the home in a cool, well-ventilated environment. Lightning strikes are another cause of fires, but there is little that can be done other than to minimize damage by unplugging electrical equipment and using surge protectors, which may or may not provide protection. For all of the other common fire hazards listed here, just a few moments of awareness and being proactive can make all the difference.